One hundred and forty nine years ago, Captain Wilson Lynch offered the use of one hundred and sixty acres of his family land on the outskirts of Galway city to host the Galway races. Hence the name for the new building which racegoers will see for the first time next week. Maintaining the tradition of continuous improvement, which is the hallmark of Galway racecourse, next week sees the unveiling of the 2,000 square metre Wilson Lynch building at the location previously occupied by the old tote building, beside the parade ring. The impressive new building contains a betting office and tote hall on the ground floor, and a Champagne bar on the first floor. Work began on this building two days after the completion of the 2017 summer festival, and, in spite of the inclement and prolonged winter weather, a fabulous new building awaits racegoers next Monday evening. Michael Moloney, general manager of the racecourse, is rightly proud of this latest development. “Racegoers will be surprised at how good the view is from the new building, and over 2,000 people will be provided with cover in this area,” Michael says, as we discuss the upcoming festival. 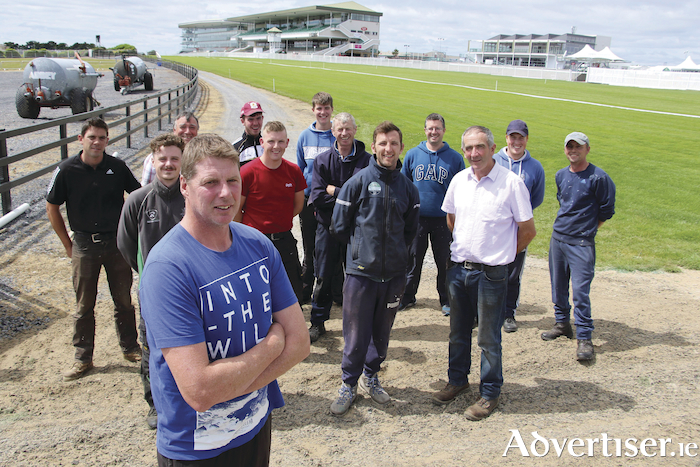 Now in his fourth year at the helm of Ireland’s most successful racecourse, having served a 20-plus year apprenticeship at the feet and hands of his father, John, Michael is confident that another bumper festival awaits us all next week. Michael is happy with the state of the ground the horses will be running on, and is confident, unless there is a dramatic change in the weather, that the surface will be ideal after an unusual weather pattern in recent weeks and months. The extended winter seemed to last until Easter, and there was heavy rainfall though the earlier months of the year. As we are all well aware, there has been a practical drought in recent weeks, and normally this would be a cause of concern for anyone involved in racetrack preparation. However, there were 18 millimetres of rain in the middle weekend of July, the track has been watered using the racecourses own water supply, and all is set fair for ideal racing ground next Monday evening. The Galway Plate was the traditional highlight of race week, and Wednesday was a day for many Galwegians to take an afternoon off and enjoy the biggest day of the festival. In recent decades, the Thursday of race week, with its combination of Ladies Day and the Galway Hurdle, has overtaken Wednesday as the marque day of race week. Indeed, in recent years, the crowd on Thursday has been double that of the Wednesday. This has presented the racecourse management with a dilemma. Do they just observe the comparative decline of Plate day, and accept it, or do they try to reverse the trend? The initiative taken this year has been to move the Wednesday racing from a late afternoon slot to an evening meeting. Though the move has received some criticism, in general, it has been welcomed. ‘When the racing was held in the afternoon, I was unable to attend due to work commitments, but now, I am looking forward to going to the ‘Plate’ for the first time in years’ has been the response of more than one grateful racegoer. Bookings for next week’s festival are well up on last year, and the team in Ballybrit are confident that a successful week is in store. “Not just corporate, but also regular ticket sales are up on last year,” says Michael, as he confidently predicts a large turnout at Ireland’s most well attended racing festival. In addition to the racing, this year’s festival will host a number of events to add to the occasion. The Galway Tenors will help get proceedings off to a rousing start on Monday, and throughout the week crowds will be entertained by The Paddy Power Zorbing Derby (Tuesday ), Jive Dancing (Wednesday ), the Pub Pint Race in aid of Western Alzheimers (Saturday ), many interviews with the stars of the turf, and over 40 live music performances during the week. Saturday and Sunday are family days, and there will be a multitude of events to entertain children of all ages on these days. The days of the carousels and bumper cars from the infield now belong to another era, as the centre of family entertainment has moved to the Mayors Garden and other locations within the enclosure. As we walk through the office and the enclosure, and observe the staff preparing for the week ahead, the sense of calm is in complete contrast to what is about to unfold over the coming week. “The staff here drive the festival,” is Michael’s summation of the role played by both those who look after the office, and those who tend the course. He is quick to credit the permanent staff for their contribution to what makes the festival such an annual success. “Gerry Broderick and his team out on the course and the ladies (and one man ) in the office, they drive the festival,” says Michael, and he appreciates the effort they all put in. “Every year, people who have been involved with the festival, return” as it is a privilege to be associated with such an iconic Galway event, “whether as temporary staff helping out at the course in the weeks leading up to the festival, or involved with catering and the multitude of other areas where their contribution helps make the festival an annual success”. Michael is also quick to credit the track’s sponsors for the role they play in the enduring popularity of the festival. The Tote has recently signed a new three-year deal to continue its sponsorship of The Tote Galway Plate, and other major sponsors include Guinness, and Betway who have joined this year for the first time. Michael says he is looking forward to working with them. The week is also well supported by local sponsors, and Michael appreciates how dependent the festival is on these local businesses. Local hotels such as the Galmont Hotel & Spa, the Claregalway Hotel, the Galway Bay Hotel and the Clayton Hotel, and other local businesses such as Colm Quinn and Caulfield Industrial have been mainstays of the festival for a number of years. There is record prize money on offer, with a total prize fund of over €2 million for the week. The minimum race value has increased from €15,000 in 2017 to €17,000 this year. With prize money of €300,000 and €250,000 respectively, the Guinness Galway Hurdle and the Tote Galway Plate are among the most lucrative NH races run during the season. October Meeting Extended to Three Days. The October meeting has been extended to three days for 2018, with racing on Saturday, Sunday and Monday of the bank holiday weekend. The total number of days racing in 2018 will now be 13, with meetings on September 17 and 18, and October 9, in addition to the summer and October festivals. The Saturday of the October meeting will be a dedicated family day, with Sunday in aid of breast cancer research and Monday the popular student raceday. The Galway race committee has recently announced that tenders are being sought for a design team for a new €12 million redevelopment planned for the track over the next four to five years. In many ways, this is where the real success story of the Galway Races is to be found. Never resting on their laurels, the committee is always looking for the next area of development to improve the racegoers’ experience. Reaching the pinnacle of success has taken a lot of hard work from both the management and the committee: staying there presents continuous challenges. Michael and his team do not just meet these challenges, they relish them. With big teams expected from the Willie Mullins, Gordon Elliott and Joseph O’Brien yards, and the added bonus of Ruby Walsh due back from injury in time for the festival, the stars are aligning for what promises to be a great week. “Arrive early, and look after yourself and others,” is Michael’s final piece of advice to all intending to travel to this special Galway occasion. I can’t wait.